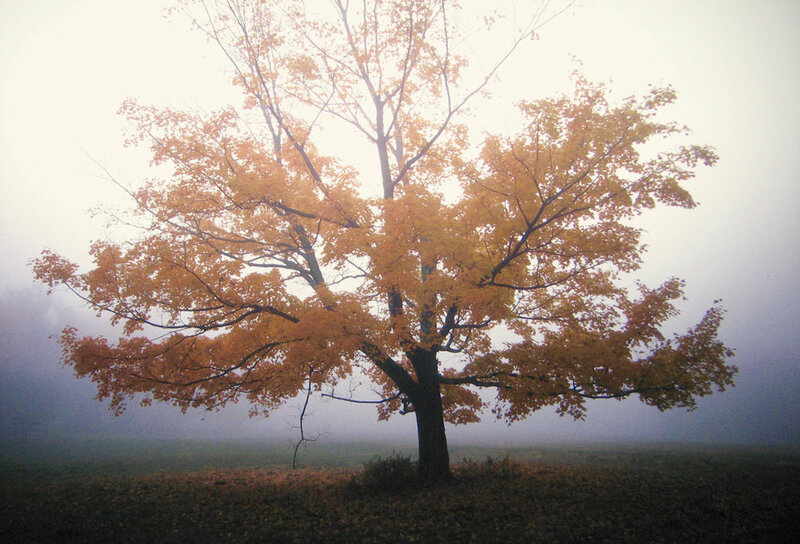 "Autumn Maple, Fog, Sunset" was made several years ago in mid October just west of the Platte Clove in the northern Catskill Mountains. It was warm and humid weather and the soft light brought out many delicate shades of yellow and gold especially in the maple trees. I was driving east late in the afternoon toward the upper entrance of the Platte Clove in search of subjects that would photograph well in color and black and white. A thick fog had moved in and created ideal conditions for me. As I was driving I looked into a small field near the road on my right. There, cloaked in fog, stood an object of absolute perfection as only nature could create. This incredible old yellow-gold maple stood entirely isolated from the forest clutter behind it begging me to take its portrait. I stopped immediately and began to unload my equipment. At this particular time I was photographing during fall with both color and black and white film. Since I was using the 8x10 camera I chose my subjects very carefully. This seemed like an image with great potential, so I made the first picture using black and white. I got close, more interested in the lower part of the tree and its details than the entire thing itself. Amazingly as I was about to make the exposure a gentle breeze appeared and stirred the fog. As I watched, the fog thinned and revealed a low setting sun glow directly behind the tree. I quickly made the exposure and waited to see what was next. The breeze now began to move the fog so I changed my position to make a color photograph. By the time the camera was repositioned, the fog had thinned considerably and I made a color image as fast as I could. Later, when the films were processed and examined it became clear that the black and white image had great substance and would make a beautiful print, but the color image simply did not work as well. In all aspects of life timing is everything...but never more so than when photographing nature.